Original Jamaican pressing in a UK laminated flip back sleeve. It would seem that the Jamaican issue precedes the UK press, but can only be found in the UK sleeve (see below). Note that When I Die I Shall Live Again is repeated, making 7 tracks on Side A not six. Also, B6 Praising Time is wrongly listed on the label as Passing Time. 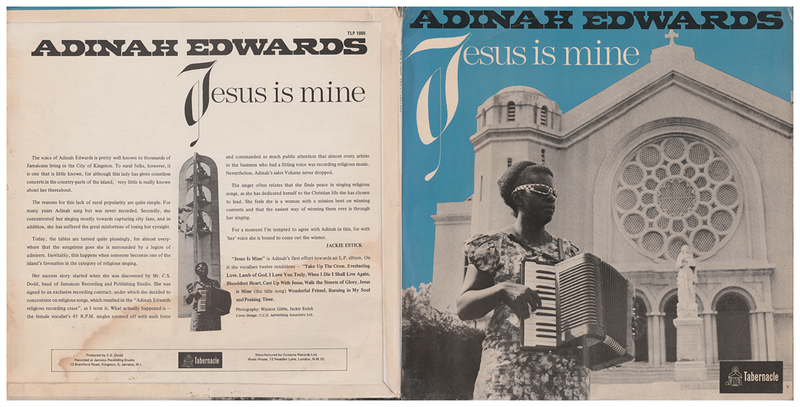 Adinah Edwards recorded (at least) 18 religious songs at Studio One in the late 1960s, all of which were released on the Tabernacle label. As well as five titles that were issued as 7" singles (including Praising Time), she also contributed two tracks to the TAKE UP THE CROSS various artists' compilation (credited to Edinah Edwards). Adinah's strident vocals are accompanied by accordion, pedal steel guitar, electric bass, organ, drums and tambourine. Recorded at Jamaica Recording Studio, 13 Brentford Road, Kingstone, Jamaica; Manufactured by Coxsone Records Ltd., Music House, 12 Neasden Lane, London. Jackie Estick contributes the sleeve notes; photography is credited to Winston Gibbs and Jackie Estick; cover designed by C.C.S. Advertising Associates. Jamaican repress with stamped matrix in the same laminated flip back sleeve as above, printed in the UK. The A and B sides are reversed from the JA issue, with 6 tracks each side (but this time the titles on the labels are the wrong way round).